President Trump cancels first UK trip as president, planned meeting with PM Theresa May, claims 'bad embassy' deal behind cancellation. President Donald Trump abruptly cancelled a planned trip to the United Kingdom, writing in a late-night tweet just before midnight Thursday that the cancellation was due to a “bad deal” for a new US embassy in London. Trump was expected to travel to England in February, his first trip to Britain since taking office last January. The president had planned to meet Prime Minister Theresa May and with Queen Elizabeth, and take part in a ribbon-cutting ceremony for the new US embassy in London. But late Thursday night, Trump tweeted that he was backing out of the trip, citing the “bad deal” behind the embassy move. The decision to relocate the US embassy in Britain from Grosvenor Square across the Thames to Nine Elms Lane was made during the last months of the Bush administration in 2008. At the time, officials cited security concerns, claiming that the existing structure could not be properly reinforced. 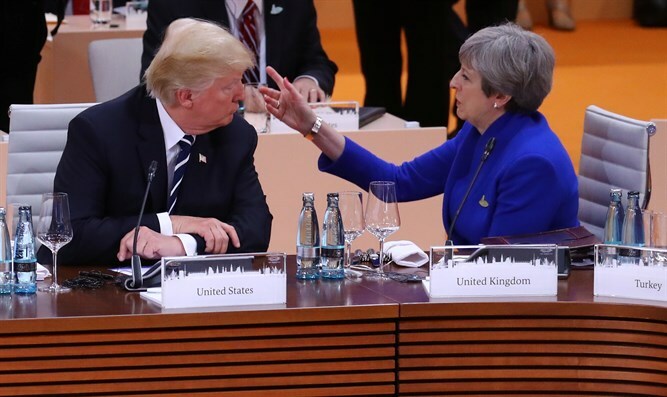 Despite the president’s tweet, a UK official said that the invitation for a full state visit – including a meeting with Queen Elizabeth, was still on the table, CNN reported. "The invitation for a State Visit has been extended and accepted," the official said. Critics of the president, including former Labour UK chief Ed Miliband, suggested that the cancellation was made in light of mass protests which were widely expected to accompany the president’s trip.